By default, some wireless adapters enable "Power Saving". This is a "sleep mode", or rather an energy-saving feature. This means that the adapter will turn off the network connection when inactive. This is not a problem when using Raspberry Pi as a client. Then the WLAN connection is simply reactivated. But if you want to remotely access Raspberry Pi via SSH for example, it may not be accessible. Then it looks like the WLAN adapter is not working. Only the energy saving function is active. So it is necessary to turn off the power saving function. For each wireless adapter, switching off the power saving function looks different. As a rule, the energy-saving function is always active. 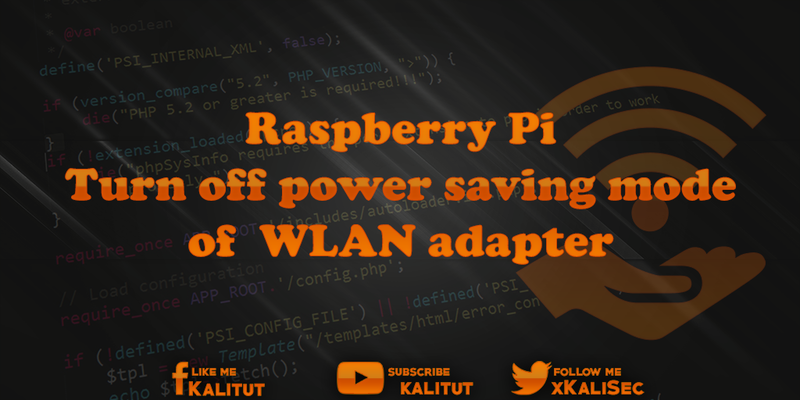 If you have problems reaching Raspberry Pi via the WLAN adapter you should first locate the manufacturer, if you do not already know that. Often, however, one also has to do with noname products. In the short term, the problem can be solved by staking out the WLAN adapter and plugging it in again. Then it is reinitialized and Raspberry Pi is again accessible via the WLAN. However, this does not help as a permanent solution. So it's about switching off the energy saving function permanently. To turn off the power saving mode of a wireless adapter, there are several options that do not all work. It essentially depends on whether the kernel supports the feature for the wireless adapter, or whether you need to choose a product-specific solution. If the first two variants do not work for the WLAN adapter used, then you should look for a product-specific solution. Since Raspbian Stretch, the Ethernet and WLAN network interfaces have different names. So no longer "eth0" and "wlan0", but "enx ..." and "wlx ...". This concerns USB-connected network adapters whose names differ from the designations mentioned here. This means that one must first determine the individual name or change the naming to the old method. After saving and closing with Ctrl + O, Return, Ctrl + X all you have to do is reboot. Note: Unfortunately, this setting does not work with some kernel versions. This switches off the energy-saving mode due to the condition. Save, close the file and restart the system. For this solution to work, the wireless adapter must have a Realtek chipset. In this example RTL8192CU. Of course, there is the question of whether you have a wireless adapter with this chipset. If the module "8192cu" is located in one line, then you can create a configuration file for the driver. For the shutdown is active, you should restart Raspberry Pi. Whether the energy-saving mode of the WLAN adapter in question is actually switched off can only be checked in practice during runtime. But you can at least check whether the setting was adopted. We install the wireless tools for this. The command "iwconfig" informs about the WLAN interfaces. Here the option "Power Management" should be set to "off". But that does not mean it really works. Sometimes a configuration change of the drivers is necessary.